Chantel became the first student in Leeds College history to achieve a 100% pass mark at BTEC, with 18 distinctions. 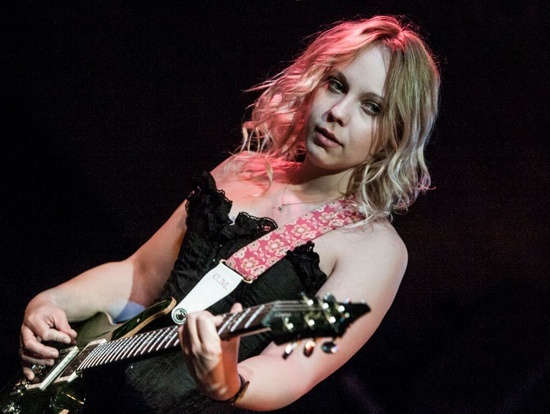 That was the beginning of her career, and 2011 she won the British Blues Awards for 'Young Artist of the Year' in 2012, 'Best Female Vocalist' in 2013, 'Guitarist of the Year' in both 2013 and 2014. So we are talking about a very talented artist here! I had the chance to meet up before her show in London in the Club 100. Backstage I found a very charming and sympathetic woman who immediately wins you over with her smile. Your latest studio album is called 'Lose Control' and it is about Southern Gothic literature. Tell us about it. I have always been very interested in Gothic. I have always wanted to write an album that means something to me. I have always been into Southern Gothic movies, arts and books so I created the story around that. Have you already had experience with Gothic, as this is a very dark side? That was the point that drives me to that, the fact that it is quite dark. I have always watched all these vampire movies and always been interested in that, but I don't have experience with that. It is more due to movies and books. I believe in Karma. If you put something good into the world then hopefully something good will come back. If you are nice to people, then hopefully nice people come back to you. And of course, the same for the other way round. I don't have a religion or anything, I just believe in being nice to people. So I definitely don't put any curses on people, haha. The interesting thing about the album is you have written each song around the topic to lose control. Therefore you have adapted the sound, the lyrics, the music to it. That is a very interesting songwriting style. You think about the result and then you write everything about it. Is that the way you write an album? It is the backward way of doing it. Many people they just write about what they feel and what comes out. But I am a bit of a perfectionist. I like to have it perfect and want to know about the endpoint of it. Rather than just having a song about a lover, that has been done million times. I want to write about topics that are different than that, but still that people can relate to. It was a challenge for myself. So I wanted to write about Southern Gothic, as I am interested in that. But it still has to be relatable, rather than just writing about vampires and witches. Therefore I really think of what I wanted to have. It is an interesting way, and it is a bit more challenging but automatically it gives you a better song as it is not just what everybody else is doing. It makes the difference, and I like challenges. That's why it takes so long to write an album, as I want to have it perfect. The only song on your album that is about your personal story is 'Home'. It is about being on the road for so long and missing home. Can you tell us about your home. How did you grow up? I grew up in a little town called Bradford in North England and it is quite industrial. It is a very interesting town, as many cultures live there. But the people are very nice. I like the diversity of the city, that's what makes the culture of it. I still live there now. I have to cats. I have a nice normal home life. That's why I do miss home when I am on the road. To me it is important to have that anchor and a lovely, normal life. What are the advantages of being on the road. What do you like most? I love the travel, too. It is so diverse, especially meeting lots of different people. I have travelled through Europe and I have been to places and towns that I normally wouldn't have been to, without a show. For example, we have been in tiny places in Germany and it was so beautiful. Normally I wouldn't go on holiday there. But this experience is great. I am pleased to have this job and be able to do meet all this people and to travel around all this great places. I want to experience even more places and be everywhere. Musically I listen to everything. Right now I am very interested in Country. On TV I am obsessed with the TV show Nashville. It is Germany's fault that this happens :) We had many off days in between the shows. So I spend a lot of time in the hotel room watching Netflix. Then I discovered the series Nashville and due to that I listen to a lot of country. But also to Folk music, heavy rock, crunch, like Soundgarten, Nirvana. But in general I listen to everything. Your first album was Blues Rock, now your latest album is more combined with Progressive Rock. So what can we expect for the next album? Maybe Country, haha. That would be different. In some ways it is a good thing to show that you are varied, but on the other hand you should also stick a bit to what you do. Are you a Rock band? Blues band? As an artist it is important that you have an identification of a style. I often say I am Chantel music, as I play what I love playing. Sometimes it is acoustic, sometimes it is heavy and hopefully people enjoy it as well. What are your goals for the future? What can we expect? I am currently in the progress of writing a third album. So I am constantly writing and then pick out the best for the album. I have the European tour in November, and then we keep on touring until the new release of the album. You also run your own label, which means you also have a business side in you. But how do you manage all that? For me understanding the business is very important. My dad is an accountant, so I grew up with understanding the business,too. Running the label, you have to deal with PRS, distribution, with every field in the industry. It is very easy to just go, 'I am a musician and that is what I do'. And then you get ripped off. But you can't do that because then people take advantage of your lack of knowledge. So you have to understand the business side too. At the end of the day music business is two words,. Music and Business, and there is no music without business. It is about making a living of music. Have you ever thought of signing to another label? Well I am always open for that if the right deal comes along. I would ask what can you do, that I can't do. If someone is better in doing things than I am, then brilliant. But if I don't have any advantage from it, then I don't see the point. Right now I can always say I am honest to myself and trust in what I do. Many other artists have even asked me to sign them to my label and I feel very pleased about that, but I am not doing that right know as I am very busy with running my own music and don't have time for that. Maybe in the future. I barely have time, especially with the business side. I have to do all the admin and publicity and emails, and even the distribution I do myself. If someone buys a CD online, I have to distribute it. I have to pack it up, go to the postbox etc. It is literally a 24/7 job. I would like practice more, but with the business it is hard to find time. Can you name us three artists. you would like to be on stage with? There is a prog guy called Steven Wilson, he is such a talented person. Stevie Nicks, she is God to me. She is such a nice person, so talented and an amazing songwriting. And then probably someone random like Lady Gaga. I know it sounds weird, but she is such an energetic and positive person and I love her power on stage. Very different people. That is where my influences are coming from. I can recommend anyone going to a Chantel gig or buying a CD will not be disappointed. Full tilt rockers to acoustic ballads and everything in between are all delivered with pristine vocals and exquisite guitar playing backed by a tight and powerful rhythm section. Gigs, whether large or small always feel intimate due to Chantel's personable connection with her audiences and her down to earth charm, add to this the improvisational element that is always present and the result is no two gigs ever being the same, and I know because I've been to a fair few. The years on the road have helped Chantel become an artist in her own right, the music is non genre specific but her own, she truly is 'Like No Other', an original. 100% recommend.